iStack iPad currently isn't available on the appstore, it's in development as is getting towards the end of the first version. I'm now starting to look for beta testers, you will need an iPad device, any iOS version will do, please post an answer to this question if you want to volunteer, I won't start testing immediately. And I'll be looking for general feedback/problems as well as bugs and crashes. Each column now has an edit button where the sites can be rearranged and moved from favourites to non favourites and this is persistent between app launches, moving a site in one column moves it in all of them. Printing Functionality all implemented and working, thanks to systempuntoout's stackprinter.com works with AirPrint, which means this app will be iOS 4.2 minimum. In app notification (red bar at the top) when a new site makes it into beta. StackPrinter in the app, without needing safari, and AirPrint functionality. Post owner pages, with associated accounts. Shrink the bottom dock so there's just the text. Add questions to local favourites. Caches the last downloaded list of questions for each site, so you can look at questions while loading the latest, including after restarting the app. I'm willing to volunteer for the Beta. 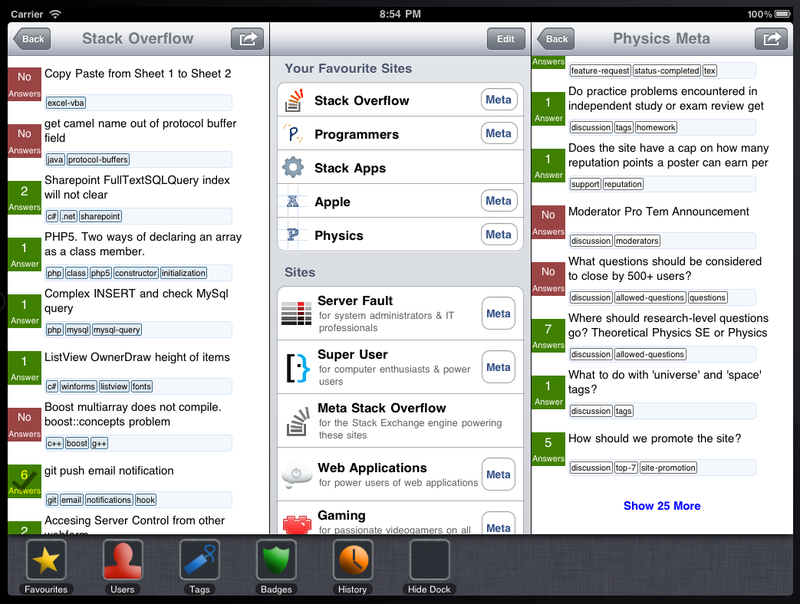 An iPad app for StackExchange is most definitely needed. I have a feeling that Apple will slap you on the wrist with this design/block your submission, due to your site navbar looking identically to the home bar introduced in 4.2 (for the iPad anyways). I'd be most interested in beta testing iStack. I'd be also very interesting to test this app. It seems very useful and helpful for stack-community. Please consider me available for test as well. Not sure if the beta is still open, but I would be willing to test this out. Dying for a nice SE app. I don't know how beta testing works, but I'd be open to testing if it is still open. I'm not a developer either, so I don't know if I even can beta test. Not the answer you're looking for? Browse other questions tagged discussion apps ipad .